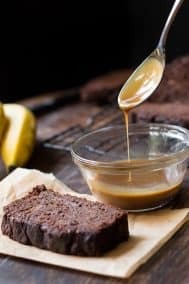 This moist and tender double chocolate banana bread tastes as good as chocolate cake, but it’s so much healthier! Made with coconut flour and raw cacao powder, it’s paleo, nut free, gluten-free, dairy-free, family and kid approved! I’ve always been a big fan of all-things comfort food. You just might be able to figure that one out browsing through my blog. 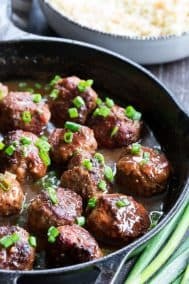 I actually own a (pre-paleo) cookbook that contains 200 comfort food recipes, and I still reference it all the time for ideas! 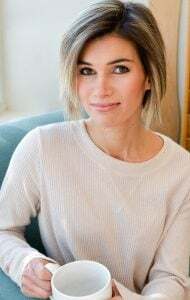 I’m not ashamed to say that I’m a firm believer in the power of comfort food – especially when we can make it just as tasty – but way better for our bodies than the original versions. Have our cake and eat it too? Yes. Have our cake (make it paleo) and eat it too. Except today, we’re not having cake, we’re having chocolate banana bread! 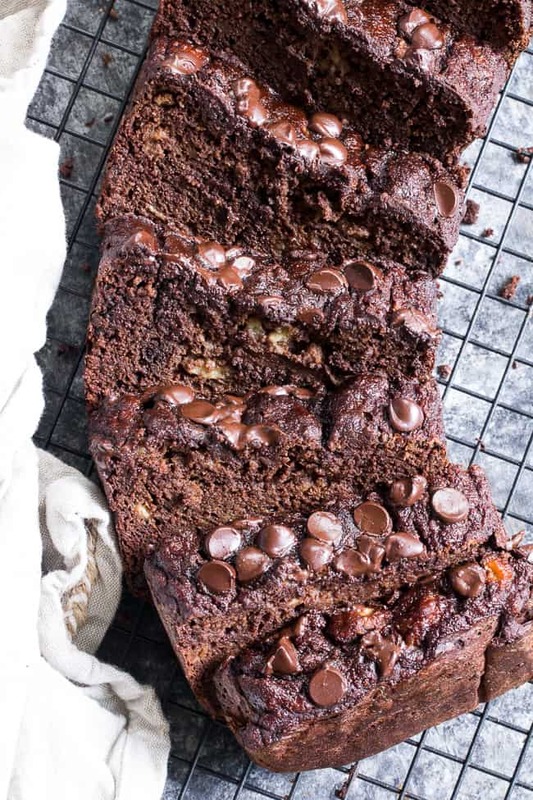 Well, double chocolate banana bread actually, and I know you won’t be disappointed! This recipe is based on a really, really old one. One of those recipes I sort of hope you haven’t discovered in the archives, due to the embarrassingly ugly photos. I tweaked the recipe over the years, experimenting with different sweeteners and flour measurements, and what you see here is how I’m currently making it. 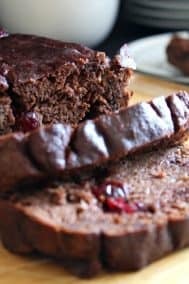 The flour is a nut free blend of coconut flour and a bit of arrowroot (or tapioca) flour, with raw cacao powder to give the bread that rich dark flavor. Bananas and full fat coconut milk give the bread lots of moistness, almost like a cake! It’s sweetened with just the right amount of raw honey (sweet enough so my kids would eat it! ), and studded with dark chocolate chips. Just as a side note on the chocolate chips, I’m okay with using Enjoy Life Brand Dark Chocolate Morsels, which contain cane sugar, making them not technically Paleo. If you’d rather stick to unrefined sweetener but still want those chocolate chips (I don’t blame you!) you can make your own homemade, maple-sweetened chocolate chunks using this recipe from Bakerita. 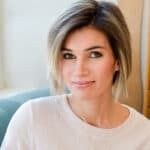 While you’re there, check out a few of her mouthwatering dessert recipes (mostly paleo + vegan) – serious YUM! 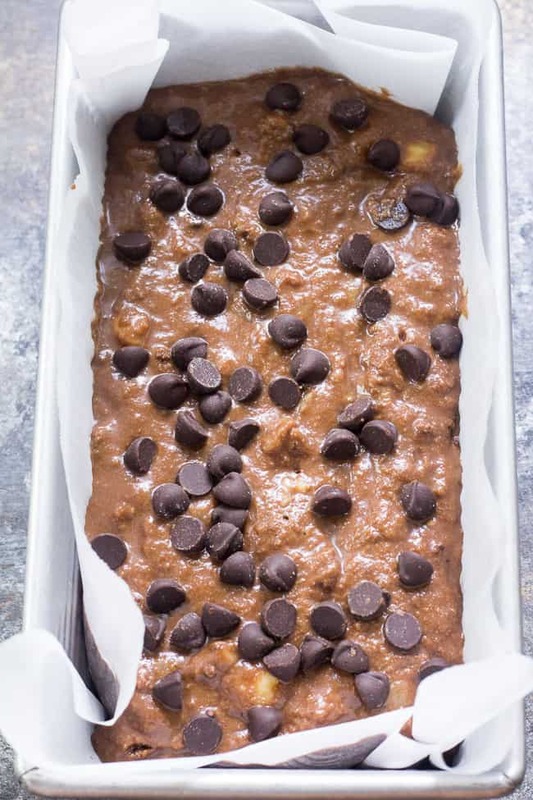 The result is what you see above – gooey, chocolatey, moist and tender paleo banana bread that’ll be a hit with anyone who dares to come along and steal a slice! This is one of those recipes that seems to disappear within 2 hours of making it – all it takes is two slices each for a family of 5! I DO recommend letting the bread fully cool to room temperature before digging in, though, since it’ll be far easier to slice and won’t fall apart. If you do happen to have leftovers, store them covered in the refrigerator, then lightly toast the bread to warm it up. It’s great for snacks, breakfast, or dessert! 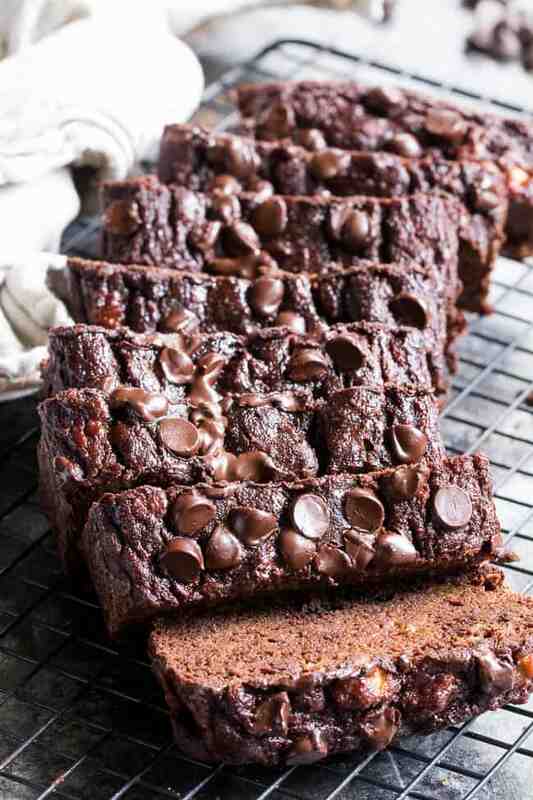 Are you guys ready to hop over to the dark (chocolate) side and bake this?! Let’s go! 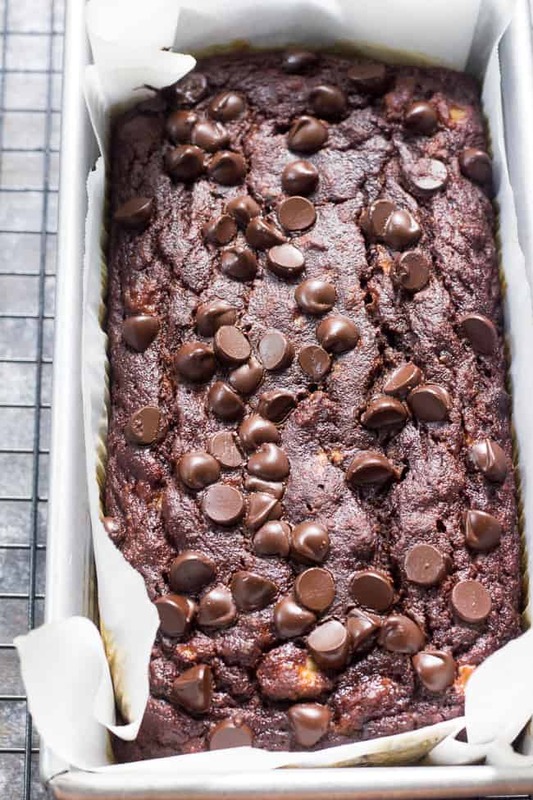 This moist and tender double chocolate chip banana bread tastes just as good as chocolate cake, but it's so much healthier! Gluten free, dairy-free, nut free and paleo. Preheat your oven to 350 degrees and line a medium loaf pan with parchment paper (I used this 8.5 X 4.5” loaf pan) but an 8 x 4" would be fine. 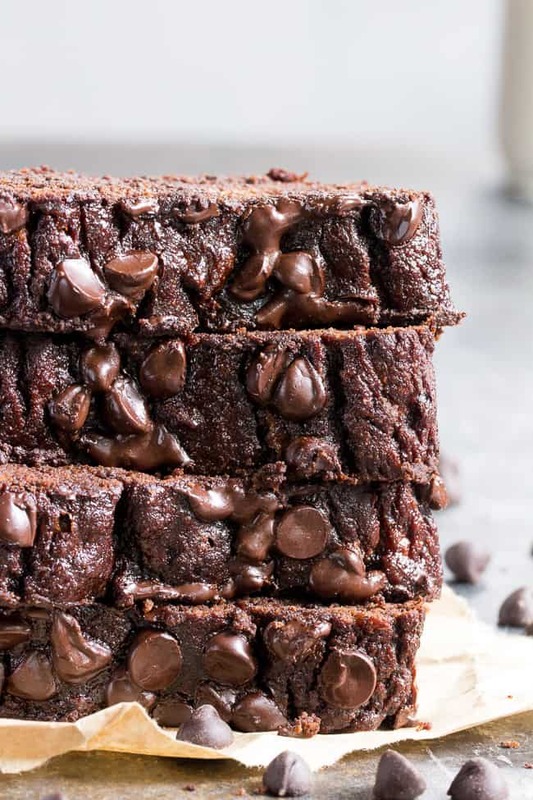 Gently whisk together all dry ingredients (except chocolate chips) in a mixing bowl - make sure to sift the coconut flour and cacao powder prior to mixing, since they can be lumpy. In a separate larger mixing bowl, whisk together the mashed bananas with the eggs, coconut milk, honey and vanilla. Wet ingredients should be as close to room temp as possible before starting. 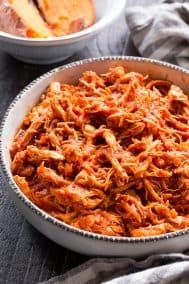 Gently stir the dry ingredients into the wet using a spatula or wooden spoon - batter should not be vigorously mixed or blended since this interferes with the bread rising. Batter should be relatively thick and lumpy once combined. Stir in about 1/3 cup of chocolate chips, then transfer the batter to the prepared loaf pan, spreading evenly. Sprinkle the remaining chocolate chips over the top. Bake in the preheated oven 50-60 minutes or until a toothpick inserted in the center of the loaf comes out clean of batter (melted chocolate is okay) allow the loaf to cool for 15 minutes in the pan, then carefully transfer it to a wire rack, holding two sides of the parchment paper to help you. Allow bread to cool completely to room temp before slicing. Store leftovers covered in the refrigerator. Enjoy! *Make your own homemade paleo chocolate chunks with this recipe. 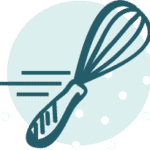 Want more delicious paleo and nut free baking recipes? Try one of these! I’m not sure, it gives it a nice moist texture and it’s not quite the same result with oil or another milk! I am becoming SUCH a fan of your blog. I like that you’re into healthy, but also into taste and texture. Thank you! Also, thank you for showing me how to work with coconut flour. 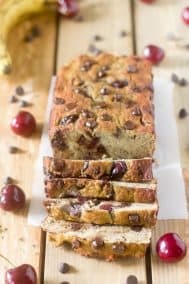 I am definitely making this when I make another batch of the amazing chocolate chip pumpkin bread you have on here, too! Side note: Lining the pan with parchment, makes these recipes come out SO EASILY. (Sometimes the coconut and other GF flours can be crumbly or stick to the pan in places.) I have no idea why I never tried that before; I use it for cookies all the time. I have an aversion to honey in baked goods, can you recommend a substitute for the sweetener? I’d love to give this recipe a try. Hi, this looks delicious! I was just wondering about the second step, I didn’t quite understand the sifting procedure. In your instructions it sounds like I should sift after I mixed the dry ingredients, but that doesn’t make sense when you then say to measure? It must be to sift the dry ingredients separately and measure the sifted version, then mix? Thanks in advance and sorry if it’s a stupid question! I made this a few days ago and it is SO GOOD! 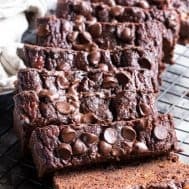 Perfect texture, just the right amount of sweetness (especially for someone who hasn’t had any sugar in over 4 months), healthy and can’t go wrong with chocolate! ! Thank you!! Michele, can tapioca/arrowroot be substituted with cornstarch, potato starch or rice flour? Thanks! I would think cornstarch, but I’m not sure of the exact measurement. Since it’s not a large amount I would think it would be pretty forgiving though. Hello . the recipe looks very delicious! I wanted to ask if i can subtitude the flour with regular weat one? 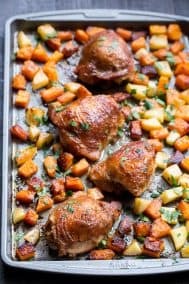 Will it work ok for this recipe? Unfortunately I’m not sure of the amount that would work, though it would be significantly more since coconut flour is so dense and absorbs tons of moisture. I would think at least double the amount of coconut flour. Love love love the few recipes I have tried from here, can’t wait to try this one! I just made this yesterday and it was delicious!! Since I didn’t have coconut milk I replaced it with 1/2 cup almond milk and the cake was still very moist . Sooo yummy! I just made it yesterday! I added carob chips and it was delicious! I saw your nutrient facts, but it doesn’t state how many servings, do you know how many are in one batch? This recipe ROCKS!!! I’ve made it 3 times and it is a huge hit in our house. Perfect every time!!! Thanks so much for the delicious recipes!!! That’s amazing to hear, glad you’re enjoying! I took mine out half way through the cooking time as it looked done and toothpick came out clean – any ideas why yours takes up to 1 hour to bake? I think mine would come out really really dry if I did the whole time suggested? I’m really not sure but all my banana breads take basically 55-60 minutes to bake, maybe it’s the pan? Made this last night and it was delicious! Our first dessert post-Whole 30. It felt like totally worth it “food freedom.” Thanks for a great recipe made from real food ingredients! Amazingly delicious, my new favorite! I’ll definitely be making again. I was worried 1/2 cup coconut flour would be heavy, but it was perfect! 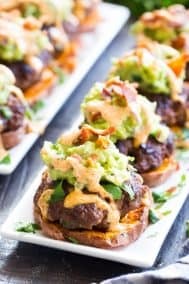 Love, love your recipes!!! Made this exactly as written (minus the vanilla as I realized last minute I was out) and it turned out fantastic! Moist, chocolatey and dense. 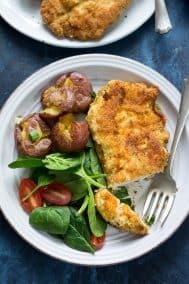 Excellent recipe that’s not too sweet, doesn’t have the overly cakey texture of coconut flour and doesn’t contain almond flour! Thanks for posting this! I am so excited to try this! I have a severe nut allergy and it is seriously so difficult to buy any healthy food since nuts are so trendy. Which means I have to make most of my own food. I really appreciate that you made this nut free!